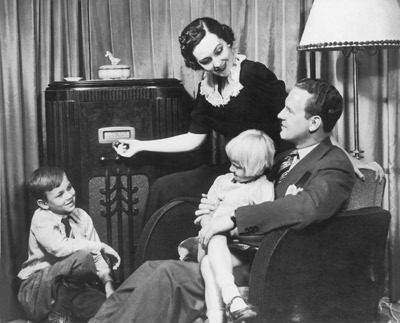 Mentioning old time radio shows probably puts you squarely in a scene of nostalgia like the one above: families in a bygone era huddled together around the radio in their living rooms, eagerly awaiting an evening of entertainment. In the present day when sight, sound and special effects are available at the press of a button, long gone are those radio show days when imagination played a key role, right? RadioGirl Productions, or RG, as they’re commonly known, would be happy to have you pull up a seat and get comfortable so that they can prove to you that the answer is a resounding “no”. RG is the creation of three women from varying backgrounds: Nita Hunter, Joan Roehre and Leslie Utech. Nita’s goal was to bring old time radio out of the past and back onto the airwaves, not only resurrecting classic shows but to showcase new productions as well. Along with a cast of dynamic voice actors and a talented crew, she and her two fellow founding members have been doing just that. Hunter, executive producer of RG Productions, has won two awards for her original radio plays "And On the Eighth Day," (a re-telling of the Scopes Monkey Trial), and “Rebecca Diamond: Private Eye". Influenced by Orson Welles and “A Prairie Home Companion“, she's happy to stay mostly behind the scenes, but will occasionally grace the stage. Roehre is a veteran stage and radio actress, performing in not only RG Productions’ events but local theater as well. She also directed RG’s production of “The Shadow, Silent Avenger”, originally a 30s era radio show whose main character was voiced by Orson Welles at one point. Rounding out the trio of founding “Girls” is Utech, a producer, director and actor. Bestowing a compliment that proves how deeply she commits herself to her roles, an audience member once commented that when Utech played Gracie Allen, she was Gracie Allen. More than twenty other actors and crew members make up RG Productions, most of them from the region in between Milwaukee and Chicago. Performing mainly at venues in that same area, RG Productions’ shows have a little bit of something to appeal to everyone. Whether they're in a historic site or a modern facility, RG uses live music, sound effects and costumes to enhance their live performances. Staying true to the tradition of old time radio shows though, their work is also broadcast on WGTD 91.1 FM out of Kenosha, Wisconsin three nights a week. Branching out into collaborative ventures, in October of last year members of RG were a part of “Nosferatu”, a multi-discipline arts event in Kenosha, WI centered around the silent film classic of the same name. This fall, they’ll be part of a “Sci-Fi-O-Rama”, performing “Flash Gordon” and “Space Patrol”. With the driving passion of Hunter behind the scenes supported by the dedication and enthusiasm of the rest of the RG Productions family, younger generations will be able to discover the appeal of old time radio for a long time to come. 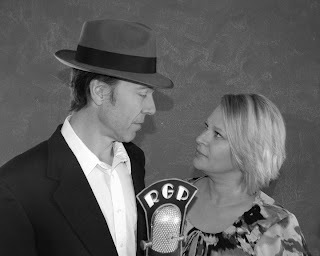 To learn more about the myriad projects that RG Productions has been involved in, see their upcoming show schedule and to hear some of their past broadcasts (including Dracula, The Grapes of Wrath, Sherlock Holmes, Frankenstein, The Shadow and more), visit their website at http://rgaudioproductions.com/.